... this is for you. You will be wrapped with the colours associated with each of the chakras. In addition to placing crystals on each chakra, I may be guided to place them on other parts of your body as well. I will use specially-made tuning forks, meant to bring each chakra back into balance. 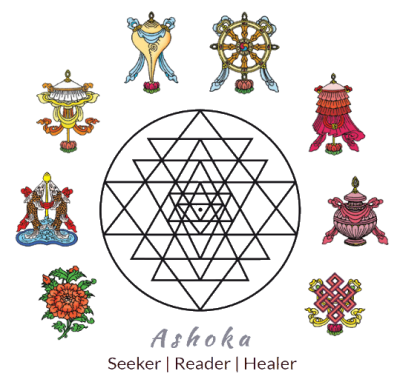 These have been tuned to precise frequencies associated with each chakra. Reiki is the foundational energy that I work with. However, because I also work with only the highest divine beings, they too would channel their energies through me, as I become a clear conduit for them. These are living light symbols printed on cards, which will recalibrate your chakras as well as other parts of your body. I may feel a need to tone specific sounds to help with the healing. I may employ the use of healing mantras as well. I will be taking you through a shamanic ceremony to open sacred space, and will be calling on your own healing guides, as well as the Ascended Masters, Angels, Elementals and only the highest divine energies to oversee your healing. You will then lie comfortably and relax while I do all the work. I will lay the coloured cloths, crystals, and living light symbols on your body. And I will work on each chakra with the tuning forks and Energy Healing. During the whole session, I will be toning and chanting sacred mantras as well. If you are experiencing pain in any part of your body, do inform me so that I can direct healing to that area. ​Sometimes, the healing may take longer than this. This is especially so when I would need to lay my hands on a certain area for longer than usual, in order for the energy to do its work effectively. As such, please accommodate for more than the allocated time. Do note that additional charges apply. If you would prefer me to keep to the allocated time, please inform me beforehand. At your own place. I am willing to travel. Please make sure you are able to lie on a comfortable mat, a massage table, or a bed with enough space to lay other items on. For sessions at your place, please add SGD $50 for transport fees. For sessions at your place, please add SGD $150 ($50 x 3 sessions) for transport fees. Please note that the price for this Package Deal has to be paid upfront. Second and third sessions have to be arranged within the following 2 months or less. If you have any queries, do feel free to write to me as well.